Only a few hundred memberships have traditionally been available for Club 33, and the waiting list was closed down for year, though it reopened in 2012 (see below). Once you get to the top of the list, there is a substantial initiation fee, plus an annual fee. If you aren’t a member, getting in requires either knowing a current member who will invite you, or attending one of the rare private events sponsored by members. Club 33 was Walt Disney’s idea. He wanted a place where he could entertain VIPs in a quiet atmosphere, so he recruited artist Dorothea Redmond and decorator Emil Kuri to design an elegant restaurant. 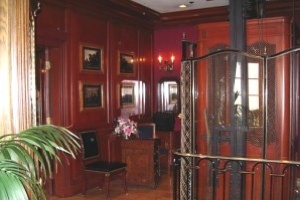 Walt and his wife Lillian shopped in New Orleans for many of the antiques that decorate the club. Sadly, Walt Disney died of lung cancer before the club opened. Straight ahead from the top of the stairs is the Trophy Room, which is used as a secondary dining room. During the special event I attended, a silent auction was set up in this room, so unfortunately I wasn’t able to see it as it would look under normal circumstances. The room’s walls are panelled with cypress and the overall feeling is that of a classic men’s club. At one time there were many mounted animals (trophies) in the Trophy Room, many of which Walt planned to make into audio-animatronics. Most have been removed, though a vulture and some small birds still remain. The vulture has animatronic wiring, but was never put into service. 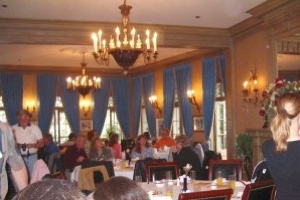 The chandeliers in the Trophy Room were wired with microphones to allow the audio-animatronic animals to “converse” with the guests. However, the microphones were never activated. A long L-shaped hallway (sometimes called Lounge Alley) connects the entryway to a wider area where the bar is located and the buffet is set up. In this hallway you can see an elaborate phone booth that was a prop in The Happiest Millionaire. 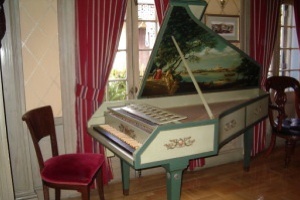 In Lounge Alley there is also an antique harpsichord and a case containing various Club 33 merchandise that can be purchased by members (and sometimes by their fortunate guests). 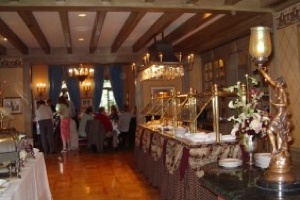 Past the buffet area is the main dining room, which seats about 70 people. 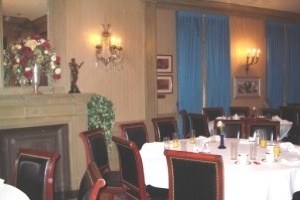 Depending on the type of event and time of day, meal service at Club 33 may be buffet only, or a combination of table service and buffet, or table service only. The private event I attended was a breakfast buffet, with a menu of huevos rancheros, sausage, ham, potatoes, mini quiches, mini Mickey waffles, fresh fruit, cheeses, oatmeal and cold cereal. By contrast, at dinner the menu includes steaks and seafood served by waiters. The Napoleonic First Empire decor in the main dining room includes elaborate moldings, lots of gilding, blue and gold floor-to-ceiling silk draperies, huge floral displays (both real and faux) and antiques. It definitely struck me as the kind of decoration someone in the 1960s would choose for a “fancy French restaurant.” While it’s not my personal taste (I’m more of a Craftsman and Danish Modern sort of gal, myself), the antiques in Club 33 are exquisite and clearly everything was chosen with quality and beauty in mind. One side of the dining room overlooks Royal Street in New Orleans Square and I’m told the balcony outside the French doors of the dining room is a wonderful place to watch Fantasmic! I very much enjoyed looking at the original works of art throughout the Club, many of which are sketches and design studies for New Orleans Square and its associated attractions, such as Pirates of the Caribbean. There are lovely bronzes scattered about. The atmosphere of Club 33 is restful and quiet. It’s hard to believe there are throngs of tourists walking along Royal Street just below the restaurant. Club 33 is the only place in Disneyland that serves alcoholic beverages. The dress code is “resort dressy” — the equivalent of “business casual” or better. In addition to the benefits listed below, Club 33 Members receive all Disneyland Premium Annual Pass discounts, benefits and services, and invitations to private members-only events. Gold Membership is only available to existing members. Annual dues are $3,600. Platinum Membership requires a $25,000 initiation fee and annual dues of $10,000. Access to Club 33 Member Services, which makes all reservations/arrangements: hotel, restaurant, VIP Fantasmic! viewing, VIP seating for World of Color, etc. Executive (Corporate) Membership in Club 33 requires a $40,000 initiation fee and annual dues of $10,000. Additionally, Executive Membership includes the ability to add up to 8 Affiliate Members, who each pay an annual fee (presumably $10,000). Want to Join Club 33? Until 2012, there was a long list (reportedly 800 names) waiting to join Club 33. In fact, Disney didn’t add any new members for about 10 years. Then Disney announced the new, much more expensive Platinum Membership (now the only membership available to new members); reduced benefits for existing (now Gold) members; and the opening of 1901, a new private lounge in Disney California Adventure. This allowed expansion of the club roster. As of May 2012, Disney is accepting new applications, though there is no guarantee you’ll receive an invitation to join. If you are interested in becoming a member, you can email dlrclub33membership@disney.com for more information.